7Solutions India consistently provides affordable, precise and time bound rebar placement drawings services. 7Solutions India engineering and technical experts and professionals actively participate in all types of rebar drawings and reinforced placement structure detailing services. Rebar/reinforced placement drawings are the detailed drawings for the reinforcing bars in cast-in-place reinforced concrete construction. 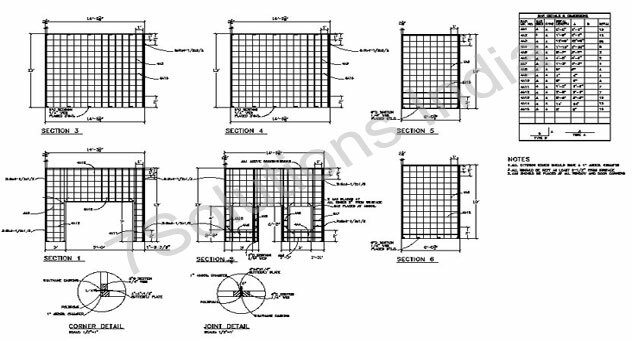 Rebar Placement Drawings or Reinforced bar placement drawings provide instructions from engineers to the contractors on how to build the structure to resist the anticipated loads. The drawings include the full details and placing instructions so that the ironworkers can set the reinforcing bars accordingly. 7Solutions India has participated in several rebar placement drawings projects globally. Rebar placement drawings are just presentation drawings and they are not defined as shop drawings. Sometimes, placement drawings are also mentioned as shop drawings but it should also remember that placement drawings are quite totally different from fabrication and installation drawings used for other construction trades. Placement drawings are the most productive requirement for detailers and contractors. Rebar placement drawings an entirely a different matter. First of all, as a part of concrete placing process, reinforcing steel is fabricated and installed because without final dimensions, rebar detailers cannot complete the detailing process and rebar placing drawings can’t take place until and unless the other drawings have been completed. Contact Us or email: info@7solutionsindia.com to rebar placement drawings services.